Everyone's excited! Those good folks at the Soundwave Festival have announced yet more Sidewaves around the country. This time, the shows extend further than usual, with the inclusion of a sidewave for Perth. Rejoice! So far, there have been 11 Sidewaves announced, involving over 30 bands, visiting 5 cities around Australia. Soundwave 2012 is shaping up to be one of the biggest ever. But wait, there's more! There will be even more Sidewave revelations in early January. Very rarely does an artist come along that defies the boundaries of convention and remains relevant in a storied career spanning over two decades selling in excess of 50 million albums. Marilyn Manson has successfully pioneered ‘Shock Rock’ whilst redefining alternative music, blazing a trail of controversy and originality. 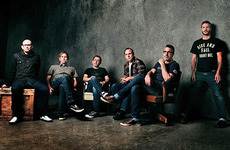 From a suburban Los Angeles garage to becoming a worldwide institution of rebellion, few bands boast a history like Bad Religion. 30 years on, the worlds still a mess and Bad Religion’s fiery songs are more relevant and necessary than ever.